I do my asparagus on the grill, also. Instead of blanching mine, I just put them in aluminum foil with a few drops of water, seal it, and throw it on a cooler part of the grill to give it time to steam. It saves dirtying a dish. My 4 year old LOVES it, also. She can't get enough. Crazy! I'd never even had asparagus until I was probably 20. 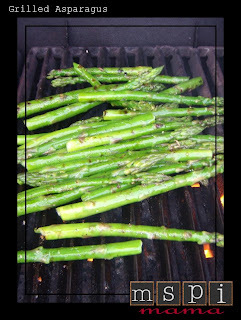 We love grilled asparagus around here too. What a great idea, Kimberly! I'll have to do that the next time. Thanks!